In late April 1911, a posse visited Laura Nelson, her son, L.W., and her husband. They lived several miles and equally distant from both Paden, Ok (a white town) and Boley, Ok (a Black town). The posse was looking for stolen meat – dead or alive. The posse was headed up by deputy sheriff George H. Loney from Okemah, Ok — Okfuskee county seat and host to the courthouse and jail. Okemah was an all white town. Not native, not black – all white. All white in a frontier of settlers and boomers and statehood only five years old. An all white town in a region that ten years prior had been Indian Territory and designated Creek. Like all the other rivers turned to lakes in Oklahoma, a trail of tears dammed. The deputy and his posse came looking for stolen meat. What they got were a couple of bullets in the leg and a stand-off. And two bodies swinging in the breeze hovering above the North Canadian River, six miles from the county courthouse. So the story goes: the deputy bleeds to death while the family keeps his boys at bay. The mother and son go to jail for the same murder. The husband turns himself in for the original crime – grand larceny. The husband is found guilty as charged and sent to prison out of town while mother and son await arraignment. Two weeks before she sips her last breath, everyone knows Laura Nelson didnʼt do it. 11p the night before her arraignment, they come for her. First, the men drag fourteen year old L.W from the county jail. At the courthouse they think to fashion a gallows from a telegraph-post and the rope they carry on their saddles. Their minds shift and quietly head for the bridge. All manner of things happen between hushed tones as they ride silently out of town with their quarry. Six miles down Old Schoolton Road the group loops 1/2” hemp into two knots. The steel bridge is christened by this judge and jury execution. Pants at ankles and hands tied at wrists, head down, L.W. swings. Dress cinched at waist, hands loose by her sides, head cocked heavy, Laura floats. The next morning, a young boy, black, walks the riverbed. 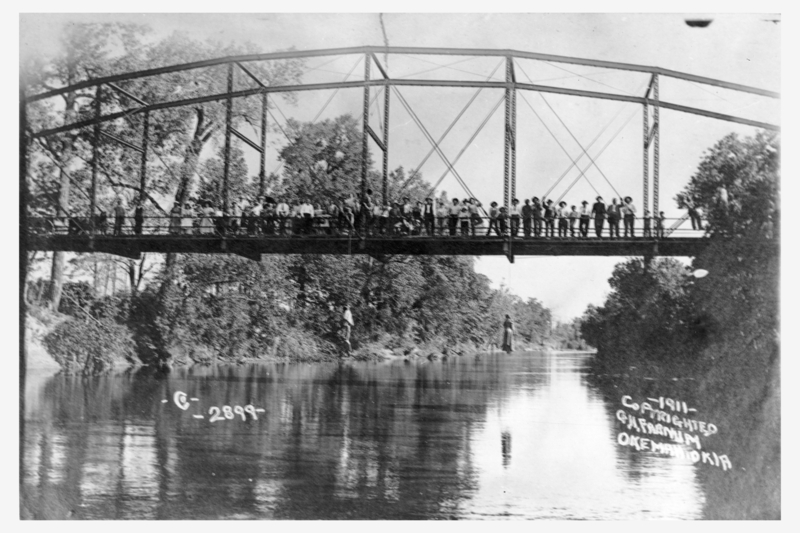 Looking up, he sees his own — swinging, floating, hanging dead from the trestle. Slow, slippery N. Canadian river below laps sandy, silty shores listening to the wind whispering the eveningʼs deeds. By afternoon a crowd gathers at the bridge to see the sights. God-fearing settlers stand side by side looking out, down, across. No black people on the bridge — only under it. Below a local photographer, G.H. Farnum, captures the moments, one by one.